SPJ DePaul Vice President Lauren Camplin (left) and Publicity Coordinator Ali Trumbull work on the social media presentation. 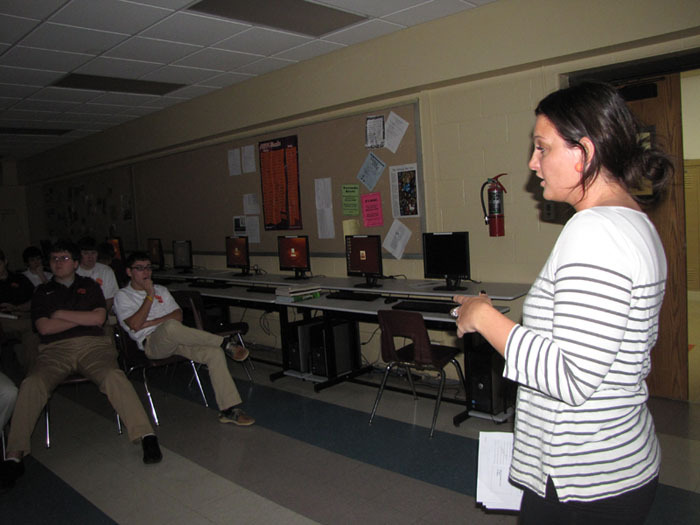 SPJ DePaul traveled to Brother Rice High School on Dec. 13 to teach a journalism class how to utilize social media for news-gathering and reporting. Three students in the class already used Twitter, but the chapter helepd register the rest of 20-plus students on the social media site. Chapter members Tabitha Hurley, Ali Trumbull, Lauren Camplin and Katie Karpowicz covered Twitter etiquette with the students, such as picking an appropriate Twitter handle, hashtags and how to retweet. Twitter is essential for students interested in journalism because people are relying more on social media sites for news delivery. 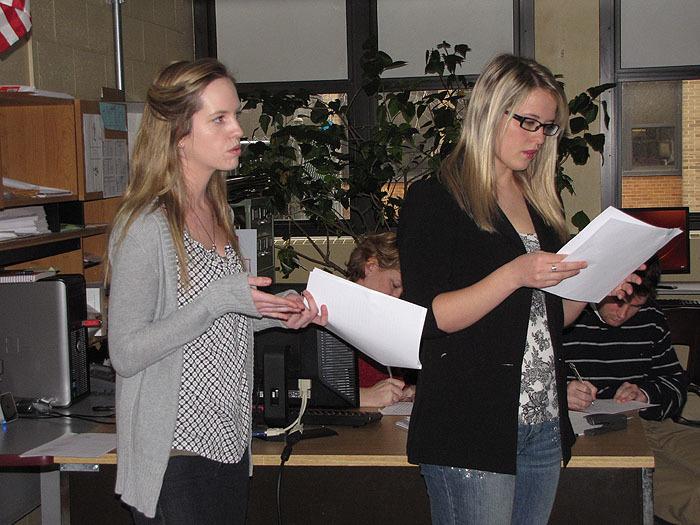 SPJ DePaul Secretary Tabitha Hurley, a Brother Rice alum, makes a point during the presentation. SPJ DePaul wanted to make the students aware that Twitter is going to play a large role in their journalism careers, if they choose to have one. Most professional journalists are required to tweet regularly in their jobs. The chapter also showed the class websites such as Twitpic and HootSuite that allow you to upload pictures to your Twitter or manage multiple Twitter accounts easier. Multiple accounts are great managing professional and personal Twitter accounts. It is always important to remember to be professional when tweeting when representing a news organization or when applying for internships or jobs with a news outlet. Other key lessons: Remember to act professional when using Twitter, have personality and fact-check what people tweet before using the information.